At the second level of practice students learn about the separation of Yin and Yang. This begins physically and then moves onto an energetic level. Within Daoism, everything that exists physically is reflected energetically and behind both of these sits a spiritual set of ‘blueprints’ on the level of consciousness. The sequential movement from physical to energetic to direct work with the consciousness enables us to understand this trinity and not get lost along the way. Students revisit exercises from the foundation stages and layer into them a new series of principles in order to begin ‘dividing the body up’. If students try this too early, without the proper foundations, it is unlikely that they will have much luck and, to be honest, a teacher that introduces this work too early is actually doing their student a great injustice. Each stage must be developed to a high level before it is built upon. The initial stages of ‘dividing the body up’ involve separating the soft tissues from the muscles and the bones. There is generally a great deal of ‘adhesion’ present within most of our bodies and so we must work towards sorting this out. Adhesions must be cleared and each section of the body must be divided up according to the principles of Yin and Yang. We do this as Qi ‘conducts’ through certain layers of the body and not others. In order to open the channels fully we wish to increase this conduction and then strengthen it through stressing the body under our own weight. This is the stage of learning systematic ‘release’ or ‘Song’. Students beginning level 2 of our system work on these principles through a combination of static and moving exercises. The gourd (pictured right) is a symbol appearing in many Chinese paintings. It is an object carried by immortals and alchemists alike. It represents (among other things) the condition of the physical body that we are aiming for in our practice. The shape of the gourd is the key to circulating the building Qi in a very specific manner. Don’t worry though, it is the inside of the body that should be shaped like a gourd, not the outside; there is no need for us to build a body that is snowman shaped! It is to do with a circular development of the soft tissues so that Qi is led in the correct manner. It is an intricate stage involving specific exercises known as the ‘San Yuan’ set and a few accompanying methods. Students begin to work on these once they have develop a high level of skill in dividing the Yin and Yang of the physical body. 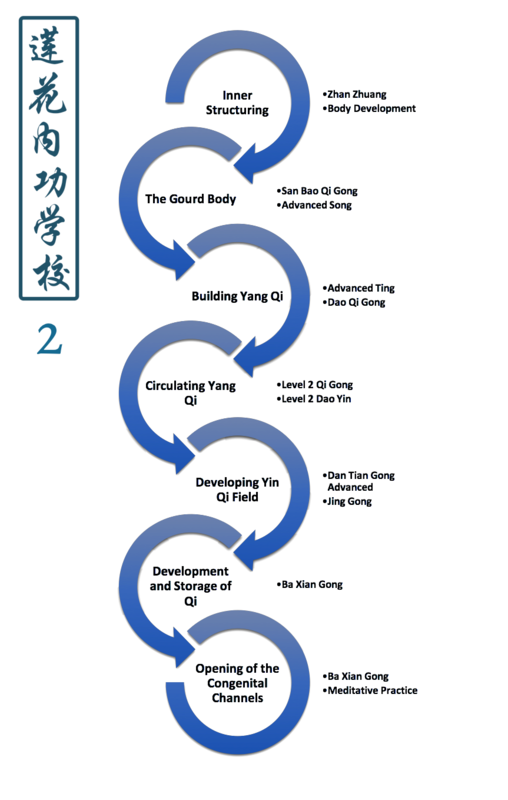 The gourd works with the movement of the channel system to pool and divide up the Qi of the body into two parts; once again labelled Yin and Yang. Every school of both Qi Gong and Nei Gong works with Yin and Yang Qi at some stage in the practice. It is a fairly advanced stage that we begin once the body is ready but don’t expect to finish with for a very long time! Yin and Yang Qi are two very specific types of energy that we must learn to work with and develop within the body. One serves to hold shape and form together through a system of ‘fields’ whilst the other moves and delivers ‘life’ to the entire of both our body and mind. We require adequate preparation for the body as well as specific mental exercises to locate and develop these two forms of Qi. We then use Yin to lead and govern Yang within the body so that we can start to build up our ability to work with and process these two very special forms of Qi. To do this we have various mental exercises as well as the Ba Xian Nei Gong or ‘Eight Immortal Practices’. The third stage of training aims to ‘govern’ the Qi. This is an advanced stage of practice that serves to develop medicinal and spiritually-based skills. The training here is demanding and only really for those who wish to go deep into the Daoist arts. It is also important that adequate foundations have been built in the previous stages.